In case you’ve noticed, this blog has been neglected for a short while. Not a long while, but maybe long enough for you to wonder if I’ve taken ill, or been arrested on some sort of trumped up charges, or perhaps abducted by vengeful Balkan gangsters and hustled off to Karakastan in a sea can, or maybe you think, he’s just gotten tired of blogging. Nothing could be further from the truth. The fact is, sometimes I need to get away. I need to shut off the computer, leave the laptop behind and fly away to somewhere. If I don’t do that periodically, I won’t have anything to write about, and frankly if I am going to write anything worthwhile, I have to have just a little decadence in my life. Oh, not big sinful decadence, but the kind of decadence one finds in a place like Las Vegas, which is where I have been for the past few days. 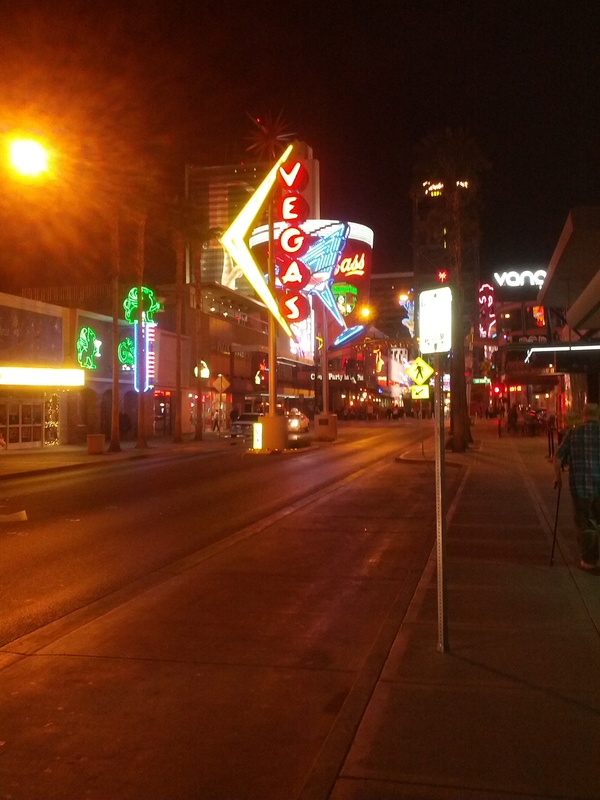 Few people are ambivalent about Las Vegas. One friend who travels there for a convention once or twice a year hates the place. There is nothing there but wholesale drinking and gambling she says and I can do that here in Florida. I tell her that’s true, and you could do that in Dubuque or South Sioux City, or even Booneville, friggin’ Missouri for cryin’ out loud. But those places aren’t Vegas. The sinful gaming industry hasn’t been around in those towns for enough years to allow them to develop real decadent character. They boast smooth, clean, well ventilated, almost ‘family’ oriented casinos. They’re the kind of casinos that reside just a couple of notches south, on the decadence scale, below a trip to Disney. When you want a particular type of decadence you need an old place with a certain vibe and a hell of a lot of history, a place that’s seen more than its share of fun, glory and drunken misery, debauchery for debauchery’s sake, someplace that is soaked in the desert springs of the once quiet and nonchalant citadel in the desert: Las Vegas — for me that joint is El Cortez Casino. 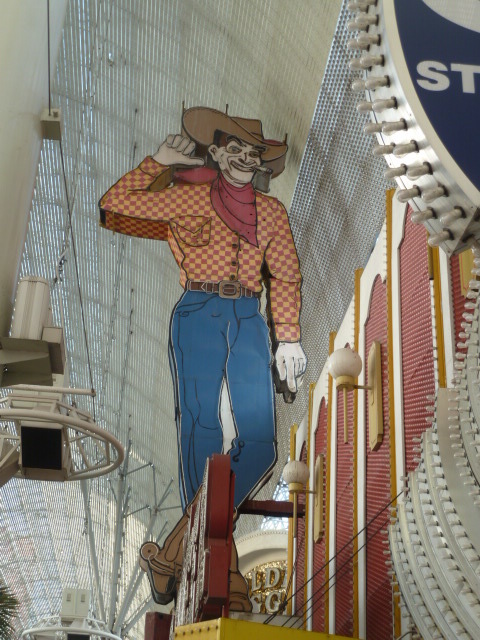 Now, I’ve been visiting Vegas fairly regularly since the early 70’s — since before Fremont Street was an experience — since before they lopped off ‘Vegas Vic’s’ hat so he would fit under the Fremont Street canopy. So I know what I’m saying. When I go to Sin City, I rarely gamble on the Strip. It’s far too slick and expensive for me. Give me Glitter Gulch. No matter how you dress it up (and believe me they’ve tried), it stays the same — “cheap booze” reads a sign over one establishment, “5 dollar blackjack all day” reads another — my kind of places. 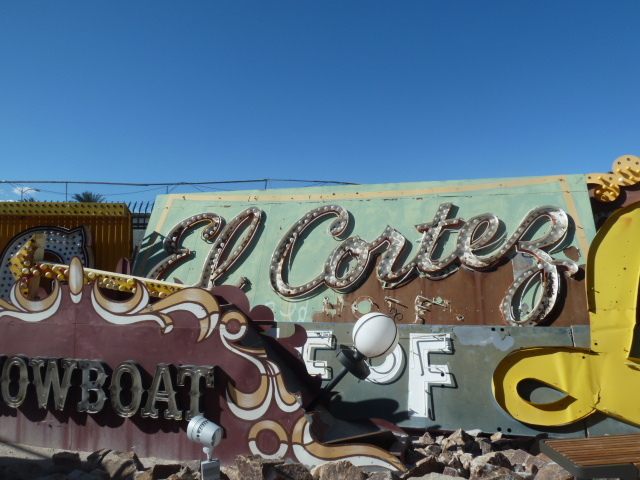 So back to El Cortez. This place has been around for so long, and it is so poorly ventilated, that I’m sure that the smoke from Lee Marvin’s Pall Malls still lingers in the stuffy casino air. Sitting slightly apart from the casinos on the main downtown drag, the El Cortez on 6th and Fremont, has been around since 1941 and has the distinction of being the only casino in town to have never changed its signage or facade. Once partly owned by Bugsy Siegel and Meyer Lansky, the El Cortez was originally thought to be too far from the action downtown to ever turn a profit, but time has proven otherwise, and I have recently learned that the somewhat dicey area east of the Fremont Street Experience now has its own gentrified area identifier: ‘Fremont East’ — come on, did they have to do that…can Starbucks be far behind?? Walking into the El Cortez last Saturday evening, I found everything pretty much the way I’d left it 18 months prior. I ordered my usual – a house wine in a water glass (stemware doesn’t fit well in gaming table drink holders). Before heading off for the roulette wheel, I scanned the joint for decadence — a guy on the run maybe, or a down and out gambler who owes some serious dough to ‘some people’ and is looking to recoup his (or her) losses. I struck up a conversation with the bar’s only video poker player, a guy who looked like he’d been there since Thursday, but it turned out he was just an accountant from Dallas in town for the weekend. Disappointed, I grunted and sauntered away to the $3 roulette wheel, exchanging a 100 dollar bill for 200 fifty cent chips. It was a lively crowd, and I squeezed into a seat beside a couple probably in their mid-30s, she: blonde and betting every number on the board. Him: hoodie and dark sunglasses, betting cautiously, sipping a Corona beer and whispering something to her periodically. Could be a dangerous couple I thought. The blonde was reckless, slapping down chips on almost every number on the table, playing it straight up on the inside and black on the outside. She was hitting just enough to stay in the game. Soon I noticed that she was inching ahead. After watching her play for awhile, I noticed that the last number she played won regularly. Still wondering if these two were on the up and up, I followed her last bet and put a chip on top of hers, on number 5 and hit it. I played the next bet the same way. I continued that way for a some time, making all of my own bets first, and then piggybacking on the last number she played, number 13 hitting three times in a row. Chance??? I thought not. I followed her lead for the next three spins, hitting two out of three, and the chips were coming my way. Then the guy in the hoodie and dark glasses whispered something to her in her ear again and stalked away, leaving the blonde on her own. After that, the wheel went cold. She covered the board and I held to my plan, plunking down chip after chip on her last bet. It was no use. Nothing is as unforgiving as a cold roulette wheel. In desperation, I followed her onto the black outside bet that everyone runs to when the chips are literally down, and made the worst mistake of a roulette players life – I forgot zero coverage…damn…when those double zeros rolled up and I lost my stack on that back outside bet, I could have kicked myself. “It was a good run while we had it,” I said to her, draining the last of my water glass wine and thinking about my missing Benjamin. “He was telling me never to play this game,” she said. When I left El Cortez, the accountant from Denver was still ensconced at the video poker machine, the blonde was preparing to play another hundred and Carl, the math teacher was shooting craps. is true bliss tedium uninterrupted?